We weren’t given the recipe on the day and the dry ingredients had already been weighed out for us, so I had no idea of the quantities used. The recipe that follows is my version. It came out rather differently to the one I made at River Cottage, but it was just as good. I didn’t use any honey in my loaf as I thought the blackberries and apple were sweet enough, but you could always add a spoonful if you like, as we did on the day. We rolled nasturtium leaves and flowers into our butter at River Cottage. What a splendid idea, it produced beautiful spiral pats of butter with a green and red flecked swirl. I didn’t make butter this second time around. This meant I had no buttermilk, so I watered down some yoghurt and used that instead. The beauty of making the two together is that you have just the right amount of buttermilk needed to make a loaf. 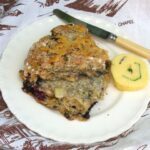 At River Cottage we added cheese to the mix – I opted for hard goat’s cheese; at home I only had cheddar so I used that instead. On the day, I discovered from fellow blogger Becky at Munchies and Munchkins, that the traditional cross on the top of Irish soda bread is to keep the devil out. The things you learn. Like all soda breads, this is quick and easy to make. It’s ideal at teatime, spread with butter or, as in our case, for accompanying a bowl of spiced courgette soup. It’s always best eaten on the day of baking, but I found it was almost as good the next day. The fruit helps to keep this spelt soda bread both moist and fresh. A delightful fruity, herby, cheesy soda bread that is quick and simple to make. Delicious spread with butter or as an accompaniment to soup. Gently stir in the fruit, herbs and all but a handful of cheese so they are all coated in flour. Make a well in the middle and pour in the yoghurt and honey if using. Stir with a flat bladed knife until the mixture comes together. Gently shape the dough into a round with your hands and place on a buttered baking tray. The dough is best handled as little as possible. Flatten roughly to 4 cm (1 ½") thickness. Dust a little flour over the top to help prevent burning then scatter with the remaining cheese. Cut a cross using a sharp knife and bake at 200℃ for 35 minutes when the bread should sound hollow when tapped underneath. If you make this blackberry and apple spelt soda bread, I’d love to hear about it in the comments below or via social media. A photo is always good too. For more delicious and nutritious recipes, follow me on Twitter, Facebook, Instagram or Pinterest. Mmm, looks wonderful. I think I’d love it with a hunk of strong cheese too although I wouldn’t turn my nose up at a slice with butter especially your lovely spiralled one! I really love the idea of adding berries in soda bread. I wonder if it works with frozen berries. It’s a fab idea isn’t it. I don’t see why it wouldn’t work with frozen berries Angie, it’s in a hot oven for quite a long time. I bet yours is just as good if not better than the one at River Cottage. I love this blackberry apple combo and I really like the cheese in this too – I’d love a slice now! 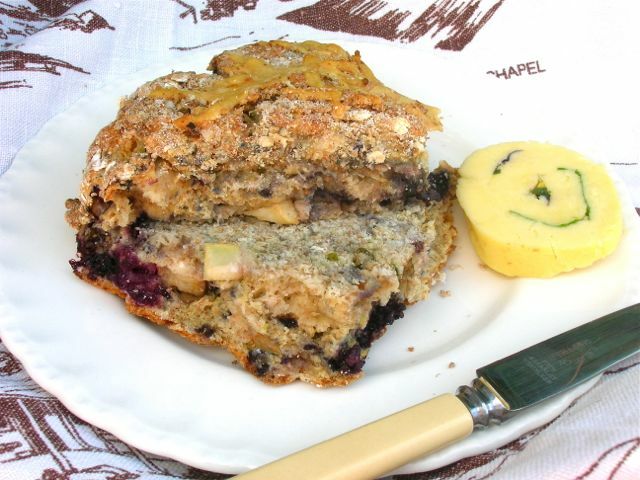 I love how you’ve paired the blackberries with the apples in this bread recipe. Sounds great! Thanks Byron. Blackberry and apple is a very traditional mix here in the UK. It probably is in the US too, but it’s the first time I’ve had it in bread and it’s fabulous. These look awesome! I love using different grains like spelt for baking!! Thanks Cassandrea. Spelt is one of my favourite flours, but it’s fun trying others too. I love different kinds of bread, especially breads with fruit. I think they are so versatile. Love the combination. I love soda bread, never tried a sweeter one thought. this sounds great! It wasn’t overly sweet Roz as I didn’t use honey, more just little bursts of it along with a bit of tartness too – very nice. This bread sounds perfect for an afternoon tea. Thank you Manu. Ooh yes, what a very good idea. Hope you are well and have a good rest of the weekend. It was so good. I love the herbs in this soda bread and the sweet/sour of the fruits. It was lovely to finally meet you at River Cottage! Ohh Choclette, I’ve just come across your wonderful new website (we’ve had a rather hectic few months and I’ve been out of the blogging loop); I love it and am off to explore… Meanwhile, what a brilliant time you all had at River Cottage; what a fabulous treat of a day out! What a gorgeous loaf, and love the idea of blackberry & apple with cheese. Sounds like a fabulous day was had by all at River Cottage, so sorry to have missed it! Thanks Kate, it really is a very tasty loaf. I’m very much hoping we might get another chance at River Cottage one day. Yum! This bread looks delicious with the fruit in it and that cheese looks beautiful! Thanks J, it’s a very tasty bread that is quick to make and easily adaptable. Thanks for sharing this! Ive got lots of apples that need using up so as well making apple pie later I think I might make this! It was delicious but definitely best served warm! Thanks Emma. It would have been nice to have had the actual recipe from River Cottage, but I was pretty pleased with this one. Soda bread is so easy to make. I love the combination of flours, herbs, and fruit with goat cheese. This is the perfect tea time snack! Thanks Leslie. I make my own bread, but sometimes it’s really nice to bake soda bread that can so quickly be put together. Well it’s a big shame you didn’t get to taste it Janie. What did J think of it? I really, really, want to take the kids out tomorrow to go pick blackberries and make this. Take them, take them Bintu. Blackberry season is nearly over. This is a perfect bread paired with a hot cup of coffee. I have never tried making a soda bread but will try this recipe soon. Oh soda bread is so quick and simple to make and you don’t have to add any fruit, cheese or herbs, but it does make it extra delicious. I love soda bread, I have never tried spelt, now you got me curious! Thank you for sharing this recipe, it looks delicious! Thanks Sara. Spelt is my favourite flour and I use it for most things, it is more expensive though. What a delicious looking recipe. I’m such a big fan of soda bread, and you reinvented it in such a tasty looking way! Thanks Rachel. I’m still hoping I can find a few more blackberries in order to make it one last time – before next year! Your bread looks delicious, it brought back the taste of the one I made at River Cottage. Thanks Nayana. I’m hoping to get one more picking of blackberries so I can make it one last time this year. Shame on me for never having made soda bread. Off I go to the pantry now ..
Haha Florentina. But really not at all shameful. The wonder of blogging is discovering all these new foods. I still have yet to make a soda bread. I bet the blackberries make this a hit! The blackberries give wonderful bursts of sweetness and flavour – well worth trying. YUM. I love the combination of blackberries and apple. Thanks Jessica. It’s a classic combination and it works brilliantly in this bread. I love soda breads as they don’t need too much kneading or prepping…Love the combination of blackberry and apple – Would love to get a slice of this 🙂 You’ve just tempted me to make a batch soon. Thanks Molly. No kneading required at all. I made my third one last night for supper – so simple, so delicious. This bread looks so good, I love the combination of fruit with herbs and cheese! Would love a piece of this amazing loaf right now. Have to try this! It’s a super easy rustic bread to make Lizzy and it’s absolutely delicious.